This commentary on the Rule of Saint Benedict (RB) was produced at Pontigny at the beginning of the thirteenth century, perhaps by a monk named John, who was abbot from 1202 to 1214. It presents itself as a series of 95 sermons, but in fact covers all 73 chapters of the Rule in order. It exists in only one manuscript (Auxerre, BM, Ms. 50), and there is no record that it was ever copied. Part of the work has been accessible in recent times, thanks to Charles Talbot, who edited several long selections in two articles dating from 1958 and 1961. But interest in the Pontigny RB commentary has remained low, perhaps on account of Talbot's negative judgement of the author's teaching, which he considered "thin and nebulous, pedestrian rather than exciting, lacking in vigour and synthesis." Moreover, the author's convoluted thought, his somewhat precious style, and his excessive prolixity have discouraged study of a text that comes to 745 pages in the edition. 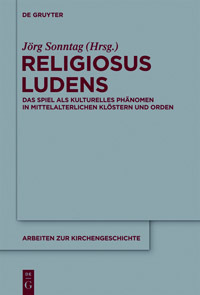 Instead of commenting on the Rule as a practical guide for daily life and as a basic statement of monastic spirituality, the author uses the Rule as the starting point for theological or allegorical developments, in which the community consists of God and the angels, or the ladder of humility becomes the framework for a Christological discussion, or the reception of novices is really about the conversion of the Jews and Gentiles. Jörg Sonntag is the first to edit the entire work. 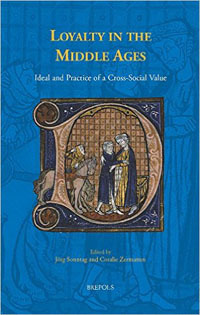 To judge from his several articles related to this project, Sonntag is eager to show the value of this unique text, which is apparently the only Cistercian commentary on the Rule from the Middle Ages. 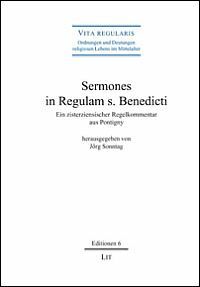 Taking exception to Talbot's negative assessment, Sonntag emphasizes the author's immense theological knowledge and exceptionally good Latin, calling the Pontigny RB commentary a kind of monks' encyclopedia. Moreover, he points out that the selections edited by Talbot are full of errors, thus preventing a balanced assessment of the whole. In his Foreword, Sonntag recognizes the difficulty of identifying the author's many and varied references, but does not consider it an obstacle to producing an edition that will give access to a wider public and encourage scholarly discussion. 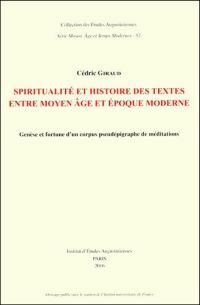 He also states that he is preparing both a detailed companion volume and a translation (ix). Sonntag has given this unusual text an unusual edition. In order to keep the reader in close contact with the manuscript, he uses different typefaces for the two different scribal hands, leaves crossed-out words in the text, and indicates the interventions of a corrector (probably the author) with square brackets. He even attempts to keep the original punctuation. This approach, which borders on creating a facsimile, is often distracting and seldom contributes to an understanding of the author's meaning, which should be the first goal of any editor. 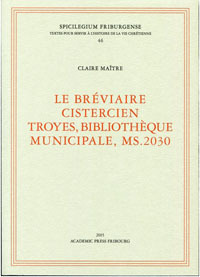 Unlike standard critical editions, where sources and critical apparatus appear at the bottom of the page, this edition places source references in footnotes and text-critical information as endnotes. These inconveniently placed textual notes also indicate discrepancies with Talbot's editions. This treatment of Talbot's work as part of the textual tradition overloads the apparatus and gives more weight to these incomplete editions than they deserve. At most this information belongs in an appendix. The volume concludes with a list of sources and three indices (scriptural references, names and places, and key Latin terms). Granted that the search for sources is important in a work by a well-read author, greater priority should have been given to identifying more of the constant biblical references and allusions. The Introduction gives little detail about the editor's choices regarding such things as spelling and capitalization. In some cases he follows common practice by retaining medieval spelling (e.g., sue for suae, prelia for proelia), but then, contrary to common practice, uses a consonantal v instead of the original u. He capitalizes Deus and Dominus, which again is acceptable practice, but creates confusion by doing so in contexts where these words do not refer to divine persons. Therefore, let us praise glorious men in their generation [Sir 44:1], the one a man of patience, the other a man of utmost humility. It is a hard and contrary thing, that is, an offense against any kind of justice, for a son [Absalom] to attack a father [David] and for a father to flee barefoot before his son [2 Sam 15:14, 30]. And it is no small injustice for a servant [Semei] to strew curses and dust on his lord the king [David][2 Sam 16:13]. But it is clear from his response that the lord king embraced all these things with a quiet mind. You have also heard of Job's patience amid the hard and harsh [cf. RB 58.8] blows of God and the words of his friends and wife. . . . In spite of a few shortcomings of this kind, Jörg Sonntag has produced a complete and useful edition of the Pontigny RB commentary. It remains to be seen whether his enthusiasm for this work will elicit the attention of scholars or inspire translators to take on such a strange and prodigiously long text. 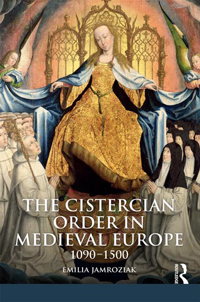 C. H. Talbot: A Cistercian Commentary on the Benedictine Rule, in: Studia Anselmiana 5/43 (1958), 102-159; Id. : The Commentary on the Rule from Pontigny, in: Studia Monastica 3 (1961), 77-122. C. H. Talbot: The Commentary on the Rule from Pontigny, in: Studia Monastica 3 (1961), 84. For instance, Jörg Sonntag: Die Benediktsregel des Himmels. 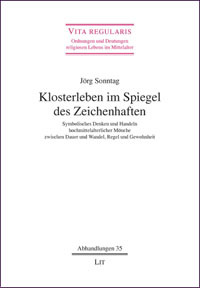 Ein Plädoyer für den Regelkommentar aus Pontigny, in: Analecta Sacri Ordinis Cisterciensis 65 (2015), 257-267.